Last week I asked her to collect five or so of her favorites so that I can work on reading them over the summer. She came back with 10, unable to pick just 5. So now this stack is sitting on my dresser, waiting for me and I'm loving it there. Every time I pass by I think of reading them during lazy weekends in the backyard, sunny days on the beach, chilly mornings in the woods, and late nights with the crickets chirping. 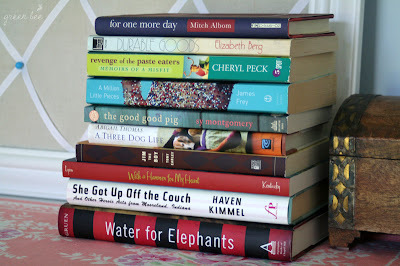 What would summer be without a good book (or 10)? I already sped through Water for Elephants this week, staying up far too late and being a bit groggy during the day because of it, but it was worth it, I thought it was very good. I'm making a note of these books! I read Water For Elephants a couple summers ago and loved it. If you haven't read The Time Travelers Wife (Audrey Neffenegger) see if your mom has it - it is excellent. At the moment I am reading Practical Magic by Alice Hoffman and have stayed up too late the last couple nights with it myself! Happy reading! I'm making notes, too! Water for Elephants is VERY good. I too loved "water for elephants" & "the time travelers wife"! I also loved Water for Elephants. Our book club read it last year and everyone agreed that it was a fabulous book. Another great one that we all enjoyed was Snow Flower and the Secret Fan by Lisa See. Right now I'm reading a book called The Luxe, which is actually a young adult book about high society life in 1899. It's a gossipy, juicy read and I've been breezing through it.